a. 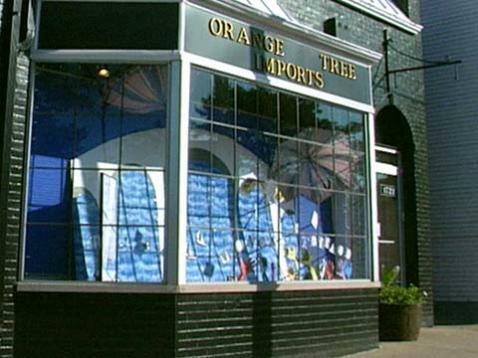 What lines of businesses is Orange Tree Imports in? How does each line make money? b. What steps would you take to monitor each business in Orange Tree Imports and determine whether it is successful? c. How would you evaluate the contribution of each business segment to Orange Tree’s overall success? d. What strategies would you use to price items in the store? How long would you keep particular items before you marked them down? HATTIE: (Voiceover) It's Orange Tree Imports, where shoppers can always find the unusual gift, from greeting cards to crystal to Christmas ornaments to kitchenware. The store is named after one of its owners, Carol Schroeder, better known as Orange. She and her husband, Dean, started Orange Tree Imports just out of college, and they've never done anything but operate this sweet spot. CAROL SCHROEDER (Orange Tree Imports): It was always my dream of owning my own store, and it just came true a little faster than I expected. HATTIE: Now wait a minute, where did you get the money to just buy this business? How old were you? CAROL: Oh, I wasn't very old . . . about 21 or 22 years old; we had some money saved up. And we were also able to borrow some from the bank. HATTIE: You were 21 and you had money saved? CAROL: Well, actually, my parents had saved money to help put me through college, and I skipped a year, so they were very kind and let me use some of the money that was saved. HATTIE: Now I get it. You compressed your college education; that's great. So you started your business with leftover college money. CAROL: Actually, what we did was we pledged that money as collateral and borrowed money against it, so that when we needed money later and were done using it as collateral, we had a little bit more cash. HATTIE: That was smart. (Voiceover) Orange and Dean started with furniture imported from Scandinavia, but through the years they've listened to customers, watched trends and formed a deep understanding of the marketplace they serve. CAROL: When we took over the store after six months of running it, we decided to get rid of the furniture. It was heavy and very difficult to deal with, and we'd have to carry it up by hand from the basement. So we got rid of the furniture. We only had gift and Scandinavian accessory items and a little bit of kitchenware. CAROL: It helps if you have a location that has lots of walk-by traffic or drive-by traffic so people notice where you are, if there are other businesses around you. But after that point, you have to really reach out to people that you feel are your target audience. Unidentified Woman #1: There are a lot of unique things here. It's fascinating. You could spend a lot of time, you could spend a whole day here. Unidentified Woman #2: It's incredible. You know, you want to go to every little shelf and take something of everything home with you. It's really nice. HATTIE: So you already have several items in your basket. Woman #2: Yes. We're planning on going to the kitchen section next. HATTIE: Do you have a credit card? Woman #2: Yes, luckily. CAROL: The more you know about who your target market is, the better. If you're marketing to teen-age kids who listen to the radio, then you need to be on the radio. If you are selling furniture to an upscale market, you might want to be in a slick city magazine. You also would want to probably do some direct mail to that targeted market. For instance, we once rented a mailing list from Bon Appetit to reach people who are interested in gourmet cooking. The way it works when you rent a mailing list is you're given permission to use it once for a specific use, and that's why it's called renting rather than buying. You can also sometimes work out an arrangement with a non-profit group where they might let you use their mailing list in exchange for a donation to that group. CAROL: We're part of a catalog group called the William Glen Catalog out of Sacramento, California. They put together the catalog with products that we vote on as a group. The stores get together once a year at the San Francisco Gourmet Show. The catalog group then arranges for co-op which means they get a discount on most of the products in the catalog in exchange for advertising them and that helps pay for the catalog. HATTIE: How often do you mail your catalog to your list? CAROL: We have a Fall catalog that we send our the end of October or early November then we do a Spring catalog that we have just done in the past few years. In the Fall catalog we're allowed to personalize it with a photograph on the inside front cover. We put a picture of our family in that spot and I have to say that is the one feature that everyone mentions when they get the catalog. They look at it and say, "gee the kids have grown." HATTIE: How do you stay special? How do you make yourself different from the big stores? CAROL: Well, we watch for lines that are being discounted, and we try not to carry the ones that we know are really prevalent in the discount or big-bucks stores. But also the fact that we present it the way we do; we select things. Stanley Marcus once said that, `A specialty shop preselects things for their customers. They choose the very best of each item, so that when the customer comes in, they know that there's something really unique about the products that are being offered.' And, also, we offer them in a pleasant environment. We gift-wrap them. We help people select them. And that doesn't happen in a discount store. I love traveling to gift shows. We're doing New York, San Francisco and Chicago this summer. I also meet with sales reps all the time and review product. And I'll look at almost anything, but I have a clear focus about what I think my store can sell, what my customers will want and will pay for it with their money. And that's how you know if a product is successful or not. It's a mistake just to buy what you want because what you like may not be what your customers are asking you for. There's so much merchandise out there, and you really have to discipline yourself not to just buy what you like, but to think about what your customers have told you they like. They vote with their dollars. HATTIE: (Voiceover) What fun it was for me to find on these shelves products from two companies we've studied here at SMALL BUSINESS SCHOOL. Jill Smith's Buck Eye Bean and Herbs' shaped pastas and other goodies occupy space in Orange's specialty food section. Judi Jacobsen's Madison Park Greeting Cards have a place in a wide selection of cards you can find only at Orange Tree. Both Jill and Judy manufacture in the state of Washington and here we are in Wisconsin. This is great. HATTIE: How long have you been shopping at Orange Tree? Unidentified Woman #3: Since the beginning, since she opened 22 years ago. HATTIE: Wow. Tell me why you come here. Woman #3: It's just a fun place to be. You can come here and look, and then you can go back a week later and find different things. HATTIE: (Voiceover) The absolute key to specialty retailing: hard-to-find, unusual products. Surprise the shopper, and the shopper will come back. CHRIS GELALICH: This is the special collector cup piece this year. HATTIE: (Voiceover) Orange is constantly staging events to attract customers to the store. Here it's Chris Gelalich of Vendor Wrap doing Christmas in July. He shows what collectors have to look forward to in the newest line of ornaments. CHRIS: (Voiceover) So we wanted to give people a preview. CAROL: (Voiceover) Well, I think that it's really important as a specialty shop to keep a certain excitement alive. You want people to want to come into the store, to feel that there's always something to see, something new. And one way to do that is to have special events. CHRIS: She was my very first appointment when I moved to Wisconsin. She works very well with vendors and, also, sales reps like myself, listening to what we have to say and what we see, what's moving, what's not moving. CAROL: He's obviously much more knowledgeable about his specific line (which is Christopher Radko Ornaments) than I would ever be because he sells that line day in and day out. And he's willing to give up a couple hours of his time on a Saturday to come and show those samples to our customers and talk to them about them. And collectors, especially, love to talk to someone that really knows a lot about a line because they want the inside scoop. They want to know what the newest color of a certain ornament is or what's being retired, and that's something that we can offer them that a discounter can't. HATTIE: (Voiceover) Orange mails invitations to the customers she knows already own ornaments from this manufacturer. Her success as a retailer depends on this type of targeted direct marketing. CAROL: When you decide what to advertise, even though it might be very tempting to run an ad to get rid of the 100 souffle dishes you have in the back room, if souffle dishes aren't selling, you're wasting your time running an ad for souffle dishes. You need to run an ad for lemonade pitchers or whatever is hot at that time of year. There are many, many details every day, and you have to keep your energy level up and keep excited about what you're doing in order to attend to all those details and make your store as successful as possible.